Unlike many Caribbean cities, where visitors fly in and then leave to find smaller tourist areas, San Juan is a beautiful capital city, with soft sand beaches, all kinds of cultural attractions, and a vibe that could easily make it a destination for an entire vacation. Beachfront luxury hotels and resorts can be found right in San Juan and neighboring districts, and historic forts, colonial architecture, fine dining, museums, and much more, are all within easy walking distance in downtown San Juan. At the heart of the city is Old San Juan, a UNESCO World Heritage Site, where colonial architecture mixes with contemporary Puerto Rican culture. The old buildings are now home to many of the city's attractions and tourist establishments. The San Juan National Historic Site encompasses a number of attractions in the area, including Fuerte San Felipe del Morro and Castillo de San Cristóbal, two of the city's main attractions. The fee for both of these is included in a single pass. 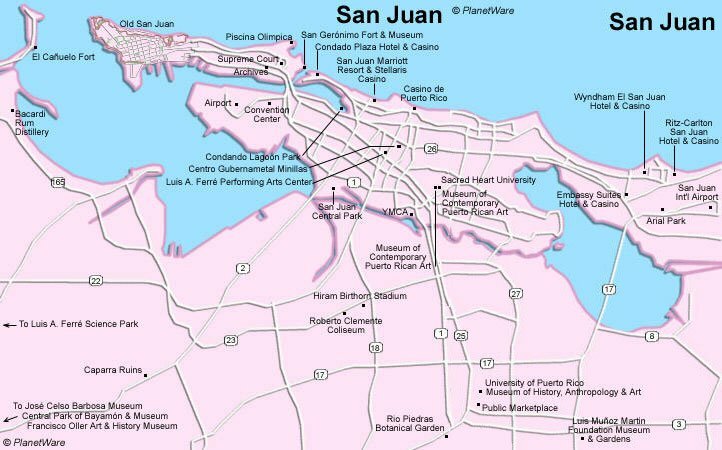 San Juan is also a major cruise ship destination, and is known for being the largest home-based cruise port in the world. Depending on the number of cruise ships in port, the city can either be very quiet or extremely lively. Showcasing almost 500 years of history, the streets of Old San Juan (San Juan Viejo) are windows to the past, with historic forts and Spanish colonial architecture setting the scene. This World Cultural Heritage Site is the second oldest city in the Americas and the oldest city under the US flag. The seven-square-block area contains more than 400 beautifully restored 16th- and 17th-century colonial buildings, many of which contain shops, restaurants, museums, hotels, and other public buildings. The most dramatic feature, and the real showpiece of Old San Juan is the Fuerte San Felipe del Morro, known more commonly as El Morro, set out on a point of land overlooking the sea. But the city's real charm can be found by simply wandering the streets, admiring the old architecture, and enjoying a meal on an outdoor patio. Other highlights are Fortaleza, the San Juan Cathedral, Castillo de San Cristóbal, and numerous museums, many of which are worth stepping in just to appreciate the architecture of the structure housing the collections. This whole area can be explored on foot, although the walk out to El Morro fort adds considerably more to the length of a walking tour. Protecting the entrance to San Juan Bay, the fort, commonly referred to as El Morro, is dramatically perched above the sea on a point of land jutting out into the ocean. A designated National Historic Site and a UNESCO World Heritage Site, El Morro was built in 1539, with ongoing construction for 250 years, and is one of the largest Spanish forts in the Caribbean. Much construction took place between the 1760s and 1780s, when many of the present walls were added. The fort today is a maze of ramps, outposts, barracks, dungeons, and tunnels, dotted with small, circular sentry boxes called "garitas." These garitas are unique to Puerto Rican forts and have become a national symbol. The area approaching the fort is open lawn and there are incredible views from every side, either back towards San Juan, including a view to the famous cemetery, or out to sea. While it is a fair distance, visitors can easily walk out to the fort from the streets of Old San Juan. While El Morro gets all the fame, Castillo de San Cristóbal is equally fascinating and well worth a visit. San Cristobal is bigger than El Morro, and is the largest fort the Spanish ever built in the New World. Spread over 27 acres, it features five independent units connected by moat and tunnel, each designed to be self-sufficient should the others fall. The fort was built between 1634 and 1790 to guard the eastern gate to what is today, Old San Juan. It was designed to protect against a land attack, making it quite different from El Morro, which was built to guard against attacks by sea. Set along the coast, adjacent to El Morro, and high above the ocean, is the beautiful San Juan Cemetery. Noted for elaborate tombstones; statues; and a circular, red-domed Neoclassical chapel dedicated to Mary Magdalene, the cemetery is a peaceful place. Set on a hillside above the sea, it also has lovely views out to the ocean and towards El Morro. The graves are all above ground, similar to those found in New Orleans. The chapel in the cemetery dates to the 19th century, and many of Puerto Rico's earliest colonists are buried here. From El Morro, there are good views looking back to the cemetery in the distance. The San Juan Cathedral, begun in 1540, is known for being one of the oldest cathedrals in the Americas and one of the oldest buildings in San Juan. The interior, with its black-and-white checkered tile floor and yellow décor is surprisingly ornate and cheery. The body of the great Spanish explorer, Ponce de León, has laid here in a marble tomb since 1913, and San Pío, a Roman Catholic martyr, since 1862. The cathedral still holds regular services, and tours are available. The Museo de las Americas, in Old San Juan, explores the history of Puerto Rico, with a focus on the art, the ethnic groups, and the colonization of the country. Permanent exhibits offer a solid overview of the country's history, but temporary exhibits round out the experience, with all kinds of interesting themes that may include anything from contemporary art to traditional practices. This museum is a good place to start before embarking on a tour of the country's cultural and historic sites. The Condado district lies on a piece of land between the Atlantic Ocean and Laguna Condado. The district was originally developed as San Juan's first tourist zone in the 1950s, creating a mini Miami Beach on the doorsteps of the city. The main axis of the town is Avenida Ashford, along which stand a number of luxury hotels and resorts. Condado offers a broad selection of accommodations and facilities in all price ranges. In the eastern area of the district is Ocean Park, a one-mile-wide beach encompassing residential homes and beach retreats. The white-sand beach is clean and very popular with locals. There are no facilities or change rooms here. Condado is also home to the huge Convention Center, with shopping, theaters, restaurants, and space for festivals and exhibitions. La Fortaleza was completed in 1540 as a defense against the Carib Indians and other foreign invaders. It was occupied twice by invaders; first by the Earl of Cumberland in 1598 and then by the Dutch General Bowdoin Hendrick in 1625 when fire damaged the building. The Fortaleza eventually lost its military value and became the residence of Puerto Rican governors, a role it still maintains today. La Fortaleza is the oldest governor's mansion still used as such in the Western Hemisphere, with more than 150 governors having lived or stayed here. The building itself has undergone many changes in its long history. The result is a blend of 16th-century military architecture with the refinements of the 19th century. The Museo de Arte de Puerto Rico is one of the highlights of San Juan, and is a prominent player in the Caribbean cultural scene. The building, which was opened in 2000, was constructed around a 1920's hospital building. The older portion of the building displays the museum's permanent collection and is the first thing visitors see as they enter. The newer portion (the east wing) is a five-story structure containing a multi-story atrium, a theater with seating for up to 400 people, a sculpture garden, and a popular restaurant. There are also other rooms available for workshops and exhibitions. In total, the museum contains more than 130,000 feet of space used to display an excellent permanent collection and host temporary exhibitions. Dominican friars built the Iglesia de San José in 1532, making it one of the earliest examples of Spanish Gothic architecture in the Americas. Unlike the San Juan Cathedral, this church is small, with a modest façade, but the vaulted interior gives it an airy feel. For almost 300 years, the Spanish explorer Ponce de León was buried here until his body was moved to the San Juan Cathedral in 1913. The 18th-century Puerto Rican artist, José Campeche, is buried here. Founded in 1984, this museum is the place to see the work of Puerto Rico's finest modern day artists. Changing exhibits showcase the museum's collection of modern island-made prints, paintings, posters, and sculptures. Located inside Sacred Heart University in the Barat building, the museum can be tricky to find. As the exhibits change frequently, be sure to contact the museum or visit their excellent website to find out about the most current exhibits. When the culture, beaches, and heat of San Juan have taken their toll and it's time for a little escape, the Plaza las Americas might be the answer. This modern indoor shopping plaza is the place to come for a little retail therapy or to pick up something that was left at home or lost at the airport. This is not the place to find traditional Puerto Rican souvenirs and trinkets; this is a large mall with US chain stores, the latest fashions, American restaurants, movie theaters, and some unique stores. It is considered by Puerto Ricans to be the best mall in Puerto Rico. Although it might not be at the top of the must-do list, this is a great rainy day option. Condado Vanderbilt Hotel: 5-star luxury beachfront hotel, Spanish Revival-style, butler service, ocean-view pool, deluxe spa. Decanter Hotel: mid-range pricing, Old San Juan location, 19th-century colonial-style building, rooftop terrace, 24-hour concierge. CasaBlanca Hotel: affordable boutique hotel, Moroccan theme, rooftop deck with soaking tubs, fantastic staff. Da House Hotel: budget boutique hotel, Old San Juan, lively neighborhood, full of character.